Secluded Cabin, sleeps 8, Spectacular Views . 3, bedroom, 2, bath , finish base. Imagine Your Own Private Natural Hot Spring ! Creekside Hot Springs Cabin is located at the base of Mt Princeton . Creekside offers Spectacular views as well as privacy. A private hot spring is located on the property. Chalk Creeks runs thru the property. There is plenty of room for friends and family. Creekside offers relaxation or outdoor activities year round. Centrally located to Salida and Buena Vista , Creekside is easily accessible . Hope to see you soon ! Imagine your own private natural Hot Spring ! Creekside offers a natural geothermal hot spring in the front yard. The hot spring is private to the guests at Creekside. . Nathrop is unique , many hot springs are thru out the valley. Geothermal hot water was thought to have restorative properties . I invite you to indulge in the hot water at Creekside Hot Springs Cabin. A short drive to Buena Vista or Salida CO. Two small CO towns that offer numerous culteral, art, and outdoor activities. Great art, restaurants, and shopping. Washer and Dryer , please start load of towels prior to check out . Laundry pod provided. Please leave glass door open 1 inch. This will ensure adequate draw. 2nd stay and we'll be back! The first time we stayed was just my wife and I at the start of fall. We loved it so much we came back and met family here in winter. We came in between some big snow storms and despite what was near record amounts the house is still easily accessible with 4wd w snow tires. We met the owner on arrival as she was making sure pathways n decks were shoveled and she told us sleds were in the garage for the lil ones that were coming. But with beautiful knee high fresh snow on the perfect hill right next to the front door, all the adults couldn't help but join in on the fun.. i had a few good wipeouts myself. Just dust yourself off, jump in the hot hotspring, wait quietly and watch a couple momma deer with fawn walk next to u as u soak, dry off and cozy up next to the fireplace. We had a perfect family getaway and we will be back again with more family n friends. We enjoyed our stay. The home was very clean and ready for us. The springs were HOT and took some work to make the tub usable without risk of burn. This was the first VRBO I've had that had no condiments in the fridge! FYI. Even though is was cold the home was warm and the fireplace was nice added warmth. I expected the home to be a little nicer for the price. The carpet is worn out and even torn in spots . The furniture is pretty beat. It's due for some updates! Other than a little needed TLC the place was great! Several deer greeted us each morning! The hot spring is lovely! Perhaps it was holiday/high season pricing, but we felt like the accommodation was expensive for what it was. Otherwise we enjoyed our stay. Always a beautiful, relaxing place to unwind! We had a wonderful time. 15 min drive to Buena Vista. My wife and I stayed here by ourselves to have a relaxing weekend and we relaxed to the max. The seclusion, privacy, wildlife, the views, and the cabin are all as good as it gets. When we arrived there were several different herds of deer in the driveway to greet us. We saw more deer than we could count over a couple days. And let's not forget to talk about the hotsprings, which is what drew us to the cabin. We were going to stay at the crowded hotsprings resort down the road, but then we found this gem. You cant beat having your own private creekside hotspring. Theres another small hotsprings bed in the creek that has been built up too. You can also pan for gold in chalk creek. You are guaranteed to see some flash in your pan. The cabin was as clean as possible and fully stocked with anything might need. I can't recommend enough and we will return and bring family and friends with us as they are all in awe of some pics and videos we took. "Imagine your Own Private Natural Hot Spring!" 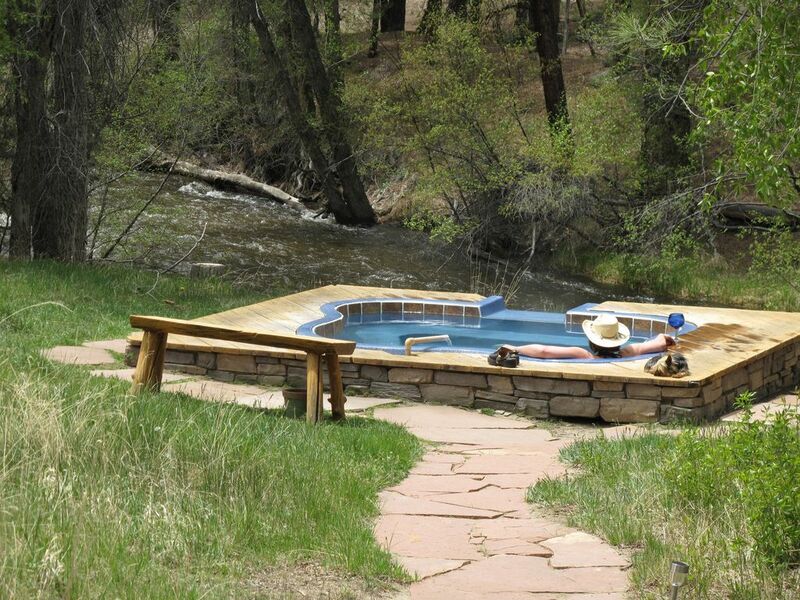 Creekside Hot Springs Cabin is located on 2 private acres. Chalk creek flows thru the property. The views from the large deck are of the Collegiate Peaks. The geothermal hot spring is 25 feet from the front door. Surrounded by tall pines the pool is very private. The cabin is comfortable for up to eight. There are two king beds and two twin beds in the main living area. The full finished basement has a trundle bed and queen roll away sleeper sofa. Creekside is a wonderful spot to unplug. No Wifi or cell service, however both are available a short ride away. We have a collection of DVD movies , books and games. Outdoor activities are right out of the front door. Creekside is a short twenty minute drive to Salida and Buena Vista. Each town has a unique mountain town feel with lots to see and do.